"The Ali Forney Center received a gift of $300,000.00 today from the Estate of legendary actress Bea Arthur. 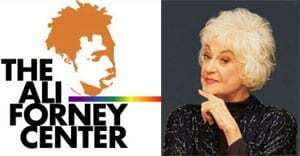 The Ali Forney Center, the nation's largest organization dedicated to homeless LGBT youth, announced at Bea Arthur's Memorial Service on September 14th that they planned to purchase a building to house 12 youths and name it her honor. 'We work with hundreds of young people who are rejected by their families because of who they are. We are overwhelmed with gratitude that Bea saw that LGBT youth deserve as much love and support as any other young person, and that she placed so much value in the work we do to protect them, and to help them rebuild their lives.' says Executive Director Carl Siciliano. The Ali Forney Center offers emergency shelter and transitional housing in seven residential sites in New York City, and operates two drop-in centers offering food, clothing, medical and mental health treatment, HIV testing, treatment and prevention services, and vocational and educational assistance. It provides services to over 1000 young people each year."